It is modern day Germany, not Dirty Harry’s 1970s San Francisco, but apparently the progressive judges and parole boards are just the same. Twenty years ago, Jessica and Sophie’s parents were murdered while they hid in terror. Now, the killers have been released from prison, because of rehabilitation or whatever. However, the dysfunctional sisters continued to feel the impact of the crimes every day of their lives. Sophie is finally ready to move on, but Jessica is not. 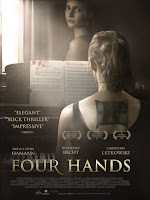 In fact, she is determined to involve her sister in her bid for vengeance, even if she has to do it from beyond the grave in Oliver Kienle’s Four Hands (trailer here), which opens today in Los Angeles. As the older sibling, Jessica shielded Sophie from the sight of the parents’ murder, but she saw it all. That helps explain her more aggressive and erratic behavior. When informed of the murderers’ release, she goes into a full manic cycle, pulling Sophie out of an important audition, so they can plan their attack. Wanting none of it, Sophie tries to flee, but their jostling leads to a fatal traffic accident. Sophie wakes up in the hospital, whereas Jessica went straight to the morgue. At least Sophie should be able to live her own life now—but not so fast. Rather disturbingly, she starts blacking out, during which time she acts quite suspiciously. She threatens the nice doctor who helped her after the accident and clearly starts stalking the murderers. Then Sophie starts picking up the voice messages Jessica leaves for her. Throughout most of the film, Kienle leaves plenty of interpretive room for viewers whether the vengeful Jessica is a supernatural or psychological phenomenon. 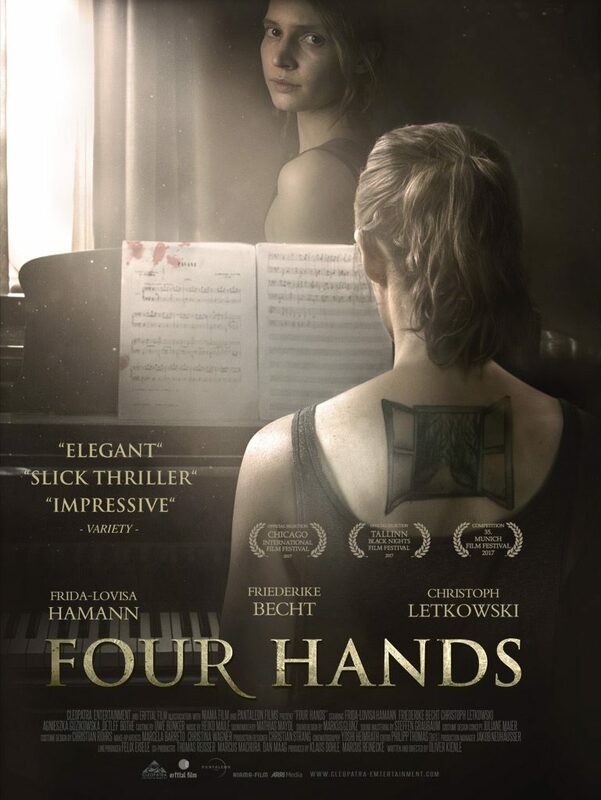 Mostly, Four Hands is a rather intriguing thriller that never crosses over into horror, but should still appeal to the aesthetic sensibilities of horror fans (although there are no one-to-one parallels, it certainly feels like Cronenberg’s Dead Ringers was an influence). 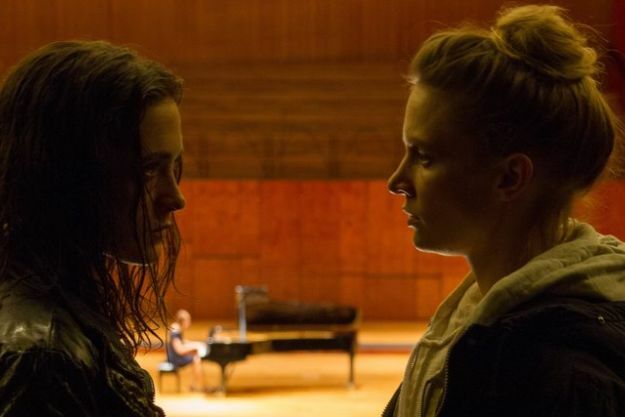 Kienle (the creator and head writer of the terrific German television show Bad Banks) is definitely playing with sister/twin/doppelganger motifs, but the film also directly explores the long-term emotional and psychological impact of violent crime, in a serious and thoughtful way. Friederike Becht is impressively fierce as Jessica, especially during the scenes in which she appears to physically take over Sophie’s body. Again, for most of the film, it is unclear whether this is an actual manifestation of the uncanny or an expressively symbolic strategy of Kienle. Conversely, Frida-Lovisa Hamann often seems problematically bland and passive as Sophie, but that is arguably required of a character who has been dominated so long by a strong but unstable personality like Jessica. Christopher Letkowski is also believably grounded and appropriately freaked out as Martin, the doctor who haltingly pursues a relationship with Sophie. There are some terrific settings in Four Hands (like the sisters’ isolated manor and a modernist concert hall), but Kienle never uses them to imitate Hitchcock or the Giallo masters. This is his film not a shallow homage. Recommended with enthusiasm, Four Hands opens today (9/14) in LA, at the Laemmle Music Hall.